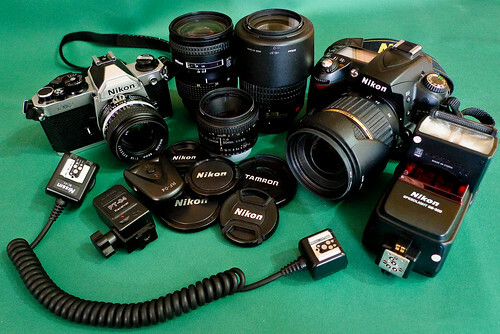 Every once in awhile I throw a few pictures of camera equipment online. For some reason these pictures end up being extremely popular on the photo sharing website I use. In fact, my second most popular photograph on the site in terms of views is simply a picture of my previous camera, a couple lenses, and a flash sitting in a camera bag. I guess people really like to look at pictures of cameras. So what am I shooting these days? Nikon D90 – Upgraded from a D40, no regrets. Nikon FM2(n) – Getting more and more use, I try to develop a roll of film every two weeks. Tamron 17-50 f/2.8 – On the D90 most of the time, my general lens. Nikkor 55-200 f/4-5.6 VR – Used when I’m lurking around the recreational hiking trail near my house shooting butterflies. Nikkor 50mm f/1.8 – When it’s too dark for the Tamron or I need optimal sharpness I use this. Nikkor 50mm f/1.4 – On the FM2 at all times. Nikkor 28-85 mm f/3.5-4.5 – Included with the FM2, besides a few practice shots I don’t use this lens. SB-600 Speedlight – I should be using this a lot more than I currently do, especially considering I have all the accessories to get my flash off my camera. Hi, Todd, Can you show me an image that you took with your Nikkor 50mm f/1.8 lense? I am interested in this lense! Thanks. This should give you an idea of how I’ve been using this lens (some of the search results are also using this lens and one other for the reverse-macro technique). Hope this helps! How about wide-angle and macro lenses? If I had to pick a macro I’d probably choose the Tamron 90mm f/2.8 Di or the latest version of the much more expensive Nikon 105mm f/2.8G. I think that would make me happy…. for a few weeks.